FOCUS OF THIS WEEK’S STUDY: Would Adam Baldwin Think That Michael Caine Would Think That Tom Cruise is a Brilliant Actor From His Performance in Top Gun? Whoa, the Navy jumbo jet that Carole gets off of is numbered 114, just like Maverick and Goose’s plane. Symbolism. I beatboxed over “You’ve Lost That Lovin’ Feelin'” at the end. Whether or not Michael Caine actually said that or if the nutty knuckleknobs behind Firefly agree, I decided to find out if Tom Cruise is a great actor. 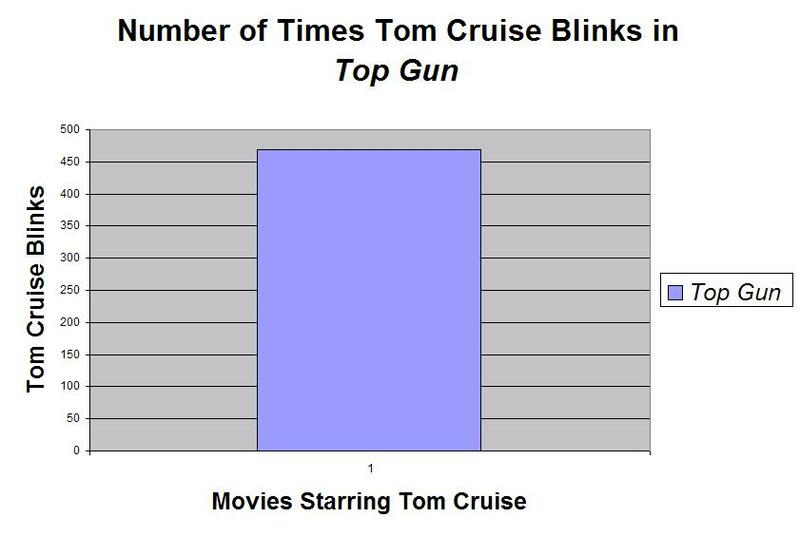 By counting how many times he blinks in Top Gun. The final tally: 469 blinks. If you come to this site for graphs, here’s a graph! I think that puts it all in perspective. What, you want math? That’s an average of 4.26 blinks per minute. Now, you may come up with a different number when you inevitably try this for yourself. I was counting on the fly, during my mandatory weekly viewing for Science, so no pauses or rewinds. I often just started counting aloud and added it the tally once Tom Cruise wasn’t on the screen any more. Also… Tom Cruise has shifty eyes. Sometimes I couldn’t tell if he was blinking or darting his eyes around. Or his eyebrows. Tom Cruise can dart his eyebrows. On top of the already Herculean task of blink-counting, I tried to scribble in the margins if any blink frequency changes struck me as significant to Maverick’s arc. During the opening MiG encounter, 4 blinks. Maverick is in control. In Stinger’s office, 21 blinks. Maverick does not fear death, but he seems to fear authority. When Jester is briefing the new class for the first time, Maverick looks over at Iceman and blinks 5 times. I believe Blinking Scientists can confirm that as a “batting” of the eyes. While talking to Charlie for the first time, 20 blinks. While in Viper’s office, approximately 28 blinks. An impressive 33 blinks while talking about his parents. Blinking = emotion? Only 4 blinks in the elevator with Charlie. Is he trying to portray a sudden swell of confidence? Probably. He’s a professional. Whoa. I don’t even need numbers here. Maverick is mostly calm and in control of his eyelids, both in the air and on the ground. Once Goose dies? He’s a goddamned blinking machine. 5 blinks boxing up Goose’s stuff, 7 blinks during his flight status hearing, 14 blinks during his first hop after Goose’s death (easily the most of any hop), and brace yourself for this: over 58 blinks while Charlie tries to get him back in the air. This can’t be a coincidence; Cruise has tapped into that universal human need to soak the eyeballs in times of stress. 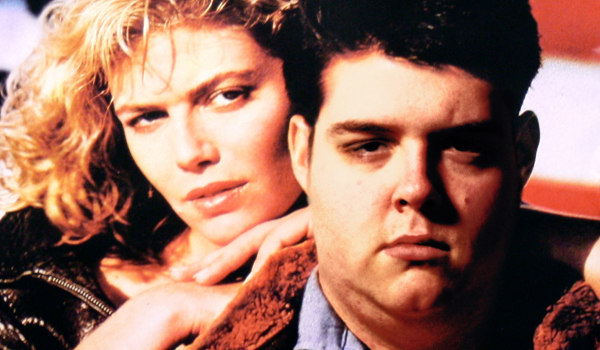 During the final encounter, he’s back to the alert, wide-eyed Maverick from the beginning. But 2 blinks for Iceman at the end. I also wondered how much of the blink count was not the work of Tom Cruise, but the editors. Cruise rarely blinks in close-up, but in a wide shot, he’s flapping away. If he is blinking while filling up the screen, he’s probably sad. I definitely see a correlation. 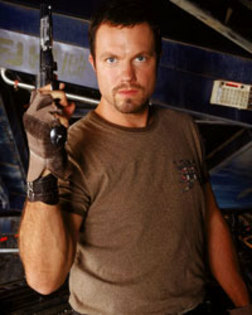 So, thank you for the inspiration, Adam Baldwin. 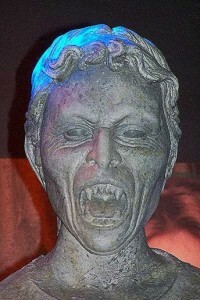 And thank you, Michael Caine, for… this? Is this what they were talking about? Well, I’ll keep that in mind the next time I watch Jaws: The Revenge.